Ellen isn’t sure true love exists until she contracts to landscape the estate of her sophisticated new neighbor. Adrian Sinclair has it all--at least on the surface. A successful businessman, he’s engaged to a beautiful woman and he’ll soon have a step-mom for his troubled son Pete. Yet, from the moment Ellen rescues a stranded Adrian on her Harley, his well-ordered world turns upside down. With his business under investigation for espionage and his son pushing for the tomboy next door as his new mom, Adrian’s façade of happiness shatters, revealing the void of faith and love in his life. As Ellen’s friendship grows with Pete, she realizes that his father is about to marry the wrong woman for the right reasons. Her resolve to remain “neighbors only” with the dad wanes as Pete works his way into Ellen’s heart, drawing her closer to Adrian. But how can her heart think that Adrian is the one when he’s engaged to a sophisticated beauty who is everything Ellen isn’t? As Ellen’s three best friends step in to help her navigate this uncharted territory, Ellen must ask herself whether she’s ready to risk the heart that she’s always held close. Will Ellen trust that God brought this family into her life for a reason? And is she willing to risk that life when Adrian's enemies threaten Pete? 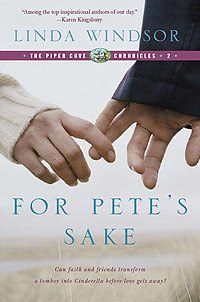 This book is the second in Linda Windsor’s Piper Cove Chronicles. If I hadn’t already been a devout Windsor fan, this story would have won me over by itself. With the skill of an expert, Linda brings the characters to life and leads the reader on an emotional journey that will have you laughing, hurting and loving along the way. Ellen Brittingham is a motorcycle riding landscape artist with a love for God and a heart for children. She is a confident, no-frills tomboy who often attracts disaster. Although I have a black thumb and would dare only to ride behind a skilled driver, I found myself able to relate to Brit, as she is called by her friends. She is real. She is believable. She will walk off the pages and into your heart. Adrian Sinclair is one of those guys you just want to take home. A business success and millionaire, Adrian comes across as a confident, high society man. Upon closer look, you realize there is a lost soul lurking behind the expensive suit and you can’t help aching as you watch the struggling relationship between him and his son, Peter. And Peter. I can’t remember when a child has so captured my heart, with the exception of my own, of course. Pete is hurting while he struggles with the difficulties of his condition. There is a loving boy locked behind the anger and formality he displays and it was pure joy to watch him slowly come out of his shell. Now, this review wouldn’t be complete if I didn’t mention the musketeers. This group of four women – Alex, Jan, Sue Ann and Ellen – shares a lifetime of friendship, support and ice cream. It is amazing to watch the dynamics of these women as they laugh together, support each other and speak the truth, even the hard truth, in love. It had me longing to be a part of their group, and thanking God for the special friendships in my own life. This book is packed with chemistry, emotion, action, laughter, fun, faith and love. It is truly one of a kind. There was not a boring moment among the pages and I found myself completely enthralled and drawn into the lives of these characters and the town of Piper Cove. I would suggest, however, that you pick up the first book in this series Wedding Bell Blues, as you won’t want to miss a moment with this unique group of women.